Our bodies are merely the vessel that contains us (our essence, our soul, our consciousness, etc…), our only mode of transportation, and at its core, just an elaborate means of maintaining our dna and facilitating its transfer to the next generation. And if our bodies were just vessels to get us around, that would be a good enough reason to maintain its health to the fullest, but our bodies are more than just vessels, they are a part of our being - there is a mind-body interconnection that cannot be overlooked. Our musculoskeletal system responds to the brain’s commands for movement, but conversely, our movements trigger neurochemical responses in the brain as well. How we use our bodies affects not just our ability to do the things we desire to do, but our mood (our mental and emotional state), our current health, and our future wellness (our lifespan). All taken together, how we treat our bodies, our physical conditioning, is what will determine not just our lifespan, but our healthspan. The Adventure LIfe Project is about taking a holistic approach to the way we want to live our lives. It’s about living a fitter, stronger, healthier, longer, more adventurous life. It is more than a destination it is a path, and it’s a path whose location can be elusive to say the least. There is a good chance that the path we have been traveling looks nothing like the path we really desire to be on. In fact there are probably many areas of our lives that we need to fix, or at least start fixing, before we could even consider changing our path. But the truth is that fixing those problems is the path. When we start making the important and most necessary changes to our lives, we have taken the first step onto the path. Most likely, there are quite a few changes that we need to make on this path and there will be many more that we encounter along the way. These changes will need to be incrementally small and sustainable, the rewards of which will take time to reap. Probably a long time (patience is a virtue, good things come to those who wait, if it’s easy it ain’t worth doing, etc…). But there are changes that we can make today that will get us going in the right direction and produce immediate rewards - we can start working out. Making significant changes to our physical condition will profoundly affect our lives in the present as well as down the road, giving us a more dynamic life, greatly increasing our lifespans, and more importantly our healthspans. The effects of these changes will be felt immediately giving us the necessary feedback and encouragement to continue. But these effects will only be short-lived if we fail to maintain and continually improve on them. The changes we will implement are not just to our routine but to our lifestyle and they are for life. Anything less than a complete lifestyle change will fail to produce the long-term results that we desire. Any movement is a step in the right direction and if you are starting from a sedentary lifestyle, just getting moving is the best action to take. But to get the benefits of fitness training we must progress to a level of real work. There are many activities that can make you sweat, get your heart rate going, and be truly difficult to carry out, but unless the activity abides by the following guidelines, it isn’t really a cardio program and will fail to produce the desired benefits over the long haul. Type - Needs to be rhythmic, continuous, and involve large muscle groups. The legs are the ideal prime movers, but shoulders and back (during rowing) could suffice. Intensity - The optimum heart rate target for endurance work is 50% - 70% of maximum heart rate (220 - age), while higher heart rates are needed for high intensity work. Duration - Minimum of 10 minutes and a goal of 30 minutes per day. For high intensity training the same time frame will work but with rest periods interspersed. Frequency - Must be performed at least three days per week with five days being more optimal. These are guidelines and the ideal fitness training levels will be determined by the current fitness level of the individual. If the individual is starting from a sedentary fitness level, then they will discover that just walking up a hill will get their heart rate into the red zone, but after a few weeks they will notice that their cardiorespiratory system is adapting to the current regime and it is time to increase the workload. Failing to do so will result in a plateau that will fail to produce further improvements. The cardiorespiratory system is actually two interconnected systems, the cardiovascular system (charged with getting oxygen to the tissues throughout the body and getting waste products from them) and the respiratory system (whose job is to exchange CO2 with O2 between the bloodstream and the air we breathe). Its application to exercise is as follows - when our muscles move from a homeostatic state (at rest) to one of increased activity, their need for energy increases and they produce more CO2 as a byproduct of this increased energy consumption. The body responds by increasing the amount of O2 coming in and the rate of CO2 expulsion via increased breathing and distributes these increases via an elevated heart rate, vasodilation (opening of the blood vessels for improved flow), and improved capillary diffusion (the exchange of O2 and CO2 between the muscles and the red blood cells). Putting these processes under this kind of short-term stress induces adaptations that we ultimately benefit from in the long run. Aerobic and anaerobic, in this case refer to physiology of energy conversion and usage. Aerobic is the slower but more efficient combining of oxygen and stored fat to produce the energy that the working muscles require for the current demand. 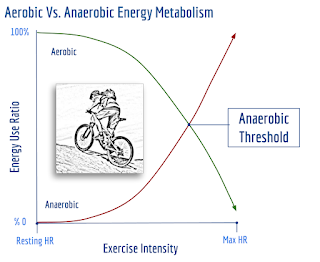 Anaerobic is the more immediate but more limited energy source for tasks of a higher intensity and shorter duration. Basically it’s like comparing the energy needs of running a marathon versus sprinting up a short but steep trail, or doing heavy squats in the gym. 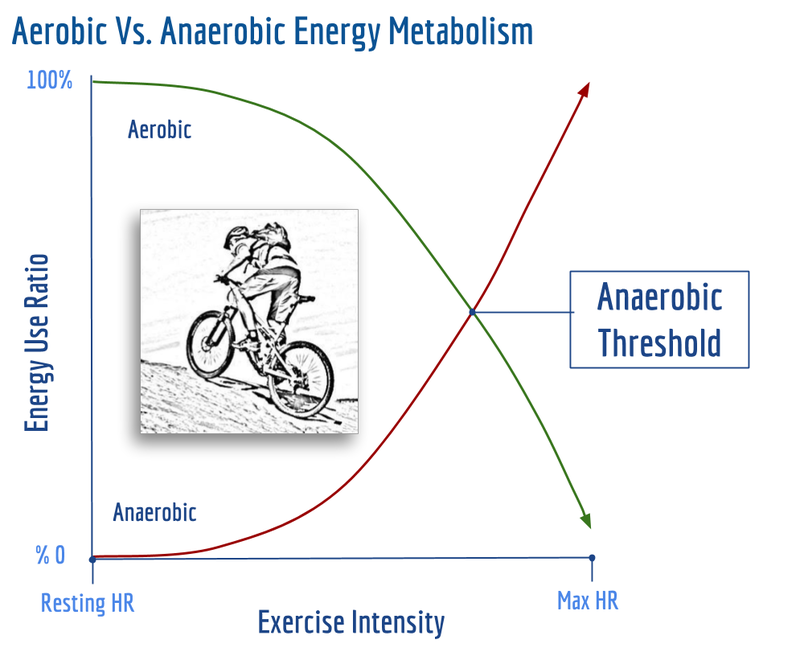 The Anaerobic Threshold - It is important to understand that the ways that our bodies convert energy is not a black and white issue. Our body does not choose between one or the other, but it is in a constant grayscale between the preferred aerobic state at a lower intensity and the anaerobic state when the intensity of the task increases. The point at which anaerobic becomes the dominant energy process is called the anaerobic threshold and can be recognized when our breathing becomes labored (when it becomes difficult to carry on a conversation). As we push ourselves beyond this point toward maximal effort we begin to hyperventilate at the extreme limit of our current state of fitness. We are now on the clock, energy speaking, and the “bonk” is sure to follow. As we train at higher levels of intensity, our bodies adapt and, in effect, we push this anaerobic threshold upward, conditioning our bodies to maintain a predominantly aerobic state at higher levels of intensity. This is one way that high intensity training can benefit a long distance runner. The ratio of slow-twitch to fast-twitch muscle fibers in a given muscle group plays a large role in this area as well, but I will leave this subject for a future post. Our body’s reaction to stress is one of accommodation (how can I reduce the immediate negative effects of this event) and of adaptation (how can I reduce the impact of this event in the future). There are hormonal changes that occur as well as physiological during the accommodation phase and there are anatomical changes that occur during the adaptation phase. Generally our body systems have an initial reaction to a stressful stimulus which can be interpreted as “negative” where we feel discomfort and even pain. If we push hard enough and long enough, our bodies and/or our brains reach a point of fatigue and even failure. But soon, or even immediately, afterward, our bodies begin to experience the “positive” effects of this stressful event. The discomfort and pain begin to subside and are replaced by feelings of euphoria (via the release of endorphins), relief (through the release of BDNF - Brain-Derived Neurotrophic Factor), and even happiness. Biologically, our bodies begin the rejuvenate and repair process, reversing the muscle breakdown process into one of rebuilding and reducing tissue inflammation as soon as possible. The Heart - As our heart becomes more efficient during exercise, it benefits from this efficiency when we are at rest. Its ability to pump blood becomes easier but more importantly, its own acquisition of nutrients and oxygen becomes more efficient. This is so important for many reasons but mostly because cardiac muscle tissue is the only muscle tissue that does not regenerate itself, so when the cardiac tissue breaks down the organ weakens accordingly and permanently. The Cardiovascular System - Blood volume increases, new capillaries form to deliver more blood to the trained muscle, there are larger openings of existing capillaries, and blood distribution becomes more efficient. As a result, resting and submaximal heart rates decrease, as well as your blood pressure. The Lungs - Through prolonged aerobic exercise, the lungs adapt physiologically via strengthened respiratory muscles (allowing for easier breathing), increased tidal volume (amount of air in each breath), increased vascularization (allowing more blood to reach the lungs), and an increase in the number of alveoli (improving oxygen exchange in the lungs). Muscles - Every system in our body adapts to stress and the muscular system is no exception. When we push our bodies our muscles react and adapt and if we push them hard enough, they fatigue, break down, and recover. This kind of stress is not only beneficial, it is required for optimal health. The beauty of the human body is that when it encounters a stressful event it not only reacts but overreacts (most-likely to be better prepared for the next occurance) and when muscle tissue breaks down it recovers and regenerates to a stronger level than before the stressful event. Through fitness training, our muscles become more efficient at extracting oxygen from the bloodstream, how they use the oxygen once they get it, and actually get better at using oxygen (with fat) as an energy source versus the more limited supply of glycogen. Metabolism - The increased capacity to use fat following endurance training results from an enhanced ability to mobilize free-fatty acids from fat depots and an improved capacity to oxidize fat consequent to the increase in the muscle enzymes responsible for fat oxidation. Strength training is more than just building bigger muscles. The stress involved in strength training will help build stronger joints and strengthen the skeletal system, improving the body mechanics that make the outdoor adventures more attainable and everyday living easier. But beyond the obvious improvements to our health and fitness, strength training will produce improvements in our overall wellness as well, including areas such as - mood, chronic disease, metabolism, and weight control. Strength training is a must, not just for the short-term benefits, but for the long-term payoff. It is not just an added chore, it is an investment. The best investment we can make is to invest in ourselves first (so does Warren Buffet), and the first part of that investment is in our health and wellness, of which strength training is integral. The primary purpose of the musculoskeletal system is to define and move the body. To provide efficient and effective force, muscle adapts to demands. In response to demands, it changes its ability to extract oxygen, choose energy sources, and rid itself of waste products. Any type of physical action or reaction our body needs to perform involves the musculoskeletal system. When we attempt to lift, push, pull, run, jump, or brace ourselves for impact, our muscles contract in a way that produces either movement (concentric or eccentric) or a lack of movement (isometric). The degree to which we are capable of this depends on the strength (size) of the muscles being contracted. This strength (size) comes from the number of the motor units (bundles of muscle fibers) within the muscle, which in turn, is dependent on the number of muscle fibers within the motor unit. This is important, trust me. Slow-Twitch and Fast-Twitch Fibers - These muscle bundles can be broken down into two categories, slow-twitch fiber bundles made up of fibers that are smaller, slower contracting, and resistant to fatigue (used in actions requiring more endurance), and fast-twitch fiber bundles made up of fibers that are larger, faster contracting, and fatigue prone (used in actions requiring more strength). Muscle Recruitment - As a load is being exerted on the muscle, only the number of motor units (muscle bundles) that are needed will contract. When more muscle bundles are needed they will begin to contract until the point where we have a “full contraction” of the muscle. Except that even in a full contraction we are really only using about a third of the muscle fibers at a given time (so we don’t tear the tendon in the process). There are extreme examples of when a person is able to exert a near complete contraction and the result is usually a surgical procedure to repair the ruptured tendon afterward. During this contraction, it is the smaller, slow-twitch muscle bundles that are recruited first, followed by the larger, fast-twitch bundles if/when needed. The heavier the load (ie. the greater the intensity), the more muscle fibers we will recruit at a given time, break down in the process, and have rebuilt after a recovery period. If the load is small (low-intensity), it will be the smaller, slow-twitch muscle bundles that will get the work, leaving the larger, fast-twitch muscle bundles on the sideline. This is the main reason why low intensity, high rep training fails to produce significant muscle hypertrophy. For the best strength building results, we need to recruit the maximum amount of muscle fibers at the same time and push them to fatigue. Skeletal System - The bones become stressed during exercise, especially strength training, when the tendons and muscles pull on the bone. This added strain on the bones stimulates bone tissue to become denser. This increased bone density will delay or even head off the onset of osteoporosis. The stress of a regular resistance training program will also improve joint function via strengthened tendons and ligaments of the trained areas. Muscular System - Muscle hypertrophy or muscle growth occurs as a result of long-term resistance training. Hypertrophy is an increase in both the size and number of muscle fibers in a given muscle. Amino acids found in protein food sources enter the cells to build muscle when the training stimulus is significant enough to require additional muscle tissue. The rate of amino acid transport into the muscle is directly influenced by the intensity and duration of the muscle tension. Neuromuscular Adaptations - The neuromuscular system is one of the first systems of the body to respond and adapt to a new training stimulus (this is where the initial gains come from). These changes are a result of the motor units in the spine becoming more responsive at stimulating the muscle fibers. Previously inactive motor units become more active and work at a faster rate. As a result, you'll experience increased strength and power. Metabolism - While muscle at rest burns more calories than non-muscle, the improvement is not as significant as it was once believed. But, the real metabolic benefit is during the use our muscles and for a period afterward. Once activated, the trained muscle in use requires a significantly greater amount of energy than the previously untrained muscle. This is why the legs can be supreme fat burners. Hormonal - Resistance exercise has been shown to elicit a significant acute hormonal response, resulting in elevated levels of testosterone and human growth hormone. A training regimen high in volume, moderate to high in intensity, using short rest intervals and stressing a large muscle mass, tend to produce the greatest acute hormonal elevations (e.g. testosterone, GH and the catabolic hormone cortisol) compared with low-volume, high-intensity protocols using long rest intervals (note that elevated cortisol triggers a dopamine response). Balance - While increasing the size and strength of the major muscle groups will help with balance, it’s the strengthening of the smaller, stabilizing muscles that contribute more significantly. Improved balance can be very important in our current everyday lives, but the real benefit comes as we get older and are more susceptible to a catastrophic fall. Having a stronger core and trunk can help us prevent the fall, or minimize its effects, and make recovery faster and more thorough. OK, so all this working out has some pretty important short-term benefits, but how does all this hard work and effort benefit us in the long run? I would like to think that the short-term benefits are more than enough reason to get out for a run or a swim or a hike, or even get into the gym to lift a few weights or squats or crunches, but sometimes we need a little more motivation. There are going to be those days that we just don’t want to do the work. And sometimes we need to give ourselves a break and take a day off to relax, but too many of those days lead to a shifting of our attitude and motivation and that is when we need to dig deeper for an even more important reason to get out and at least do something. Momentum is a powerful force and it works in both directions. There is a much bigger, more life encompassing question we need to ask ourselves when we are losing our drive to exercise and that is - “who do we want to be when we are 60, or 70, or 80, or 90 and beyond?” and “what do we want to be doing?” It can be overwhelming to feel that the minor decisions that we make today like - should I go for a run or watch the weekly football game, should I ride my bike or binge on the latest cat videos, should I get up early and go for that hike or perpetually snooze in my warm bed? It’s a slippery slope down the path of least resistance with consequences that won’t be paid for by your present self but by your future self. Sorry, I will now jump down off my soapbox. Well, after just one more point - When we reach those later years in our lives and we look back, we will have to face the reality that where we are at that moment will be the result of the choices we made way back when - which is now. While my glass is overflowing with optimism about the idea that age is just a number and that we are capable of doing all the things we were doing in our “youth” well into our “old age”, I know deep down that eventually stuff will break down and we will eventually succumb to the effects of “old age”. Even though I believe that many of the injuries and ailments we attribute to “old age” can also be attributed to just having had more time to incur those injuries, I concede that in a perfect world where we trained without injury, we would still eventually break down and die of old age. All of this training is, ultimately, just a way of slowing down the rate of decay and, in doing so, lengthening our healthspans and maintaining the vessels that we still need to carry out a “youthful” life of adventure. Making sure that we have the heart, lungs, and overall cardiorespiratory capacity to carry out the required tasks of an outdoor adventurer and buying us more time to do so is the payoff. The ultimate reward! While our fitness levels will determine how far, how high, and for how long we will go, the strength of our musculoskeletal system make up the tools that will get us there. Neglecting strength training will bring on weaknesses that will become hurdles, then obstacles, and eventually walls, in our way along the path we must be on. Analogy alert - While fitness is the engine and the transmission, our musculoskeletal system is the rest of the car (the wheels, shocks, frame, etc.). And nutrition would be the fluids (gas, oil, transmission fluid, etc.) but that’s for another post. 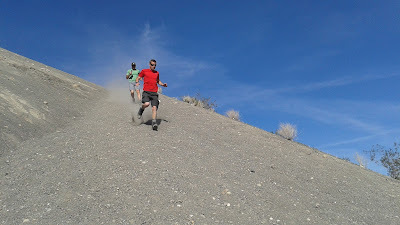 If we put all of our energy into fitness training and neglect strength training, we will be in great cardio shape, but we will eventually start to notice things like the hills are getting tougher, so we will avoid them. Our training will place more and more emphasis on high volume, low intensity workouts and, in doing so, we will weaken to the point where this becomes a necessity, the proverbial downward spiral. We won’t mind this, because we will still feel like we are in great shape, we run every day and we are still thin and fit. We won’t detect our decreasing testosterone and growth hormone levels, nor will we recognize our decreasing muscle mass and bone density. It won’t matter because we are doing what we love, what is easiest, running (or walking/hiking). But when things really start to drop off, we will realize (or maybe not) that we have become frail. Frailty is THE enemy! It is the enemy because it will sneak up on us, under the perfect cover, disguised as “old age”. It will begin restricting us from the activities we love doing, even everyday stuff, and then eventually culminating in The Fall. This is the cliff that we should have seen coming. Being frail will make the fall more likely, it will make it more devastating, and it will make full recovery more difficult and highly unlikely. The Fall is the “cliff” on our activity graph, it is what will rapidly accelerate our physical and eventually our cognitive decline. When most elderly people are asked what led to their reduced activity levels, they will refer to The Fall. Strength training is something that is so easy to ignore in the present, but it is the insurance policy that we need to take out to prevent frailty and The Fall. It is never too late to start strength training, but like an insurance policy, the longer we wait, the higher the premiums and the weaker the coverage. In the short run, getting outside, getting moving, and physically pushing ourselves will generate significant changes inside us - chemically, biologically, and emotionally. These daily spikes that we initiate will culminate in feelings of accomplishment and self-esteem that will elevate our emotional wellbeing throughout the day and into the next. But, ultimately, our goal is to not only feel better, but to be better. And while being a better person involves making big changes inside ourselves (how we perceive ourselves and the world around us and how we react to those perceptions), who we are to become will depend on both our physical, external selves and our internal, mental selves. These two states of being are interdependent with each other and while initiating the internal changes can be a long process, the external changes can be experienced immediately. Everything we do in life, from brushing our teeth to climbing Mt. Everest, can be broken down into a series of physiological processes, each of which can be further broken down into a biological and then a chemical process, all of which have an energy requirement. The amount of energy each of these processes requires will depend on the efficiency of each process. As we put our body systems under an increased, but controlled, amount of stress, these processes adapt and become more efficient. It is this increased efficiency at the chemical and biological level that we will experience at the physiological and anatomical level. We may not notice this increased efficiency while brushing our teeth, but we will surely feel it while we are climbing the stairs, or maybe even Mt. Everest. A little, or a lot, of short-term discomfort will generate a huge ROI, resulting in a more efficient, more enjoyable, more adventurous life in the long-term. If the only benefit from strength and fitness training was that we’d live a more adventurous life, I would say case closed, let’s do it. But when applied properly, its benefits go way beyond the present and near future. The path we travel can be physical, demanding, and one of participation, or it can be smooth, easy, and one of spectating. Whichever one it is, it will be of our choosing. Our decline into a comfortable, sedentary, spectator lifestyle is a slippery slope, an inconspicuous trap, that can be difficult to escape, but will only ensue if we allow it. Avoiding this trap will require a plan. Let’s start with the end in mind and work back from there. How do we envision our lives at or near the end. At 90, are we climbing the local summit, riding our mountain bikes, maybe swimming across lakes? If we are, what are the steps, and more importantly, the pitfalls, that lie in our path to getting there? How will we deal with and overcome them? Which will we conquer and which will we be forced to go around? Most importantly, which ones could stop us in our tracks? The hidden benefit of our training is that we are being prepared for these obstacles and events without even knowing it, for we really can’t know exactly what roadblocks lie ahead of us until we reach them. Strength and fitness training will better prepare us for the unknown. We must be prepared for those obstacles and crush them! The goal is not to grow old gracefully, but to go kicking and screaming (how about jumping and playing) until we reach the conclusion and upon reflection, have absolutely no regrets. In the end, we will not regret the things we did, but the things we didn’t do. Make a Plan - No, first just get moving. Waiting to come up with the perfect plan before we can get started plays into our subconscious desire to procrastinate (not doing the thing we really don’t want to do). It’s paralysis by analysis. Before we make a plan, we just need to get moving, then we must decide that whatever we are doing, and whatever we decide to do in the future, we will do it for life. The goal is how do we want to be at 90, not how do we get into our new swimsuit by Summertime. Now Make a Plan, or Better Yet, a Path - First we need to determine our starting point and build incrementally difficult training routines from there. With every change in our routine, we must pause and assess how we are adjusting to this change. Is this something we can do for the rest of our lives? If the answer is no, then we need to scale back the change, give that another few weeks and then reassess and repeat if necessary. If the answer is yes, then we are free to take the next incremental step forward. Then repeat this process until we have reached a point where the results of the change are no longer satisfactory. The Law of Diminishing Returns - As we approach our body’s true “ideal” physiological condition, the gains will become more and more difficult to attain. This is really the point that you know you are on the right track. This is the point when you can start to reassess your entire routine, your lifepath. If the results you are getting are not producing the desired feelings, then maybe you are not striving for what you truly desire. Or maybe you are striving for perfection when good or great is good enough. Whatever it is, this is where the internal changes we are making should be giving us the guidance we need. Note - The danger is that our initial goals are based on personal perspective. They are based on where we are currently, not where we would have chosen to be from an objective perspective. If we are 50 pounds overweight, we subjectively feel that we need to lose 10 or 20, but once we lose 10 or 20, we realize that we could lose another 10 or 20. It’s only when we are 50 pounds lighter that we realize that our initial goal of losing 10 or 20 pounds was pretty far off the mark. I know this from personal experience. Our goals must be extremely flexible or we could end up on the path of least resistance, settling for losing the 10 or 20, and heading back to the couch. Finally, Momentum is The Key - whatever we do, we must keep doing it in the right measure. If our program is too difficult we will hit the wall. If it’s too easy, we will fail to get the desired results or our results will plateau, we will lose interest, we lose our drive, and we will quit and go home. Momentum is very difficult to initiate, but it can be a powerful force once it gets going. Whatever the results are that we desire, there will be some work involved. The better the results, the more work we will have to put in. Nothing is free and anything worth attaining has a commensurate price tag. There is no pill that will give us the desired results, but it doesn’t have to be as brutally difficult as we have imagined it either. There is a middle ground that will give us the desired results while requiring a workload that is tolerable and maybe even, dare I say, enjoyable. Some of the work may need to be done indoors at the gym, but most of it can be done outside, which is where we want to be anyway. No matter how much work we need to do and how tolerable we can make it, ultimately, we need be doing this for the right reasons, we need be doing this for ourselves. If we are doing this for any other reason at all, we must go back to the drawing board and figure out why we are not doing this for ourselves. The answer is there we just need to find it. Exercise can be something that we can appreciate and maybe even enjoy, but beneficial exercise is also work. Baby steps - start small with the goal of constantly and steadily improving.